In the 1950s, as the United States obliterated Pacific islands to test hydrogen bombs, anti-nuclear activists challenged this devastation by trying to sail a ship, The Golden Rule, into the test zone, a protest that helped create political pressure for a nuclear test ban, as Lawrence S. Wittner recalls. Is there an emotional connection between the oceans and the pursuit of peace? For whatever reason, peace ships have been increasing in number over the past century. Probably the first of these maritime vessels was the notorious Ford Peace Ship of 1915, which stirred up more ridicule than peace during World War I. Almost 40 years later, another peace ship appeared â€• the Lucky Dragon, a Japanese fishing boat showered with radioactive fallout from an enormous U.S. H-bomb explosion on March 1, 1954, in the Marshall Islands. By the time the stricken vessel reached its home port in Japan, the 23 crew members were in advanced stages of radiation poisoning. One of them died. This “Lucky Dragon incident” set off a vast wave of popular revulsion at nuclear weapons testing, and mass nuclear disarmament organizations were established in Japan and, later, around the world. Thus, the Lucky Dragon became a peace ship, and today is exhibited as such in Tokyo in a Lucky Dragon Museum, built and maintained by Japanese peace activists. Later voyages forged an even closer link between ocean-going vessels and peace. In 1971, Canadian activists, departing from Vancouver, sailed a rusting fishing trawler, the Phyllis Cormack, toward the Aleutians in an effort to disrupt plans for a U.S. nuclear weapons explosion on Amchitka Island. Although arrested by the U.S. Coast Guard before they could reach the test site, the crew members not only mobilized thousands of supporters, but laid the basis for a new organization, Greenpeace. Authorized by Greenpeace, another Canadian, David McTaggart, sailed his yacht, the Vega, into the French nuclear testing zone in the Pacific, where the French navy deliberately rammed and crippled this peace ship. In 1973, when McTaggart and the Vega returned with a new crew, French sailors, dispatched by their government, stormed aboard and beat them savagely with truncheons. During the late 1970s and early 1980s, peace ships multiplied. At major ports in New Zealand and Australia, peace squadrons of sailboats and other small craft blocked the entry of U.S. nuclear warships into the harbors. Also, Greenpeace used the Rainbow Warrior to spark resistance to nuclear testing throughout the Pacific. Even after 1985, when French secret service agents attached underwater mines to this Greenpeace flagship as it lay in the harbor of Auckland, New Zealand, blowing it up and murdering a Greenpeace photographer in the process, the peace ships kept coming. Much of this maritime assault upon nuclear testing and nuclear war was inspired by an American peace ship, the Golden Rule. The remarkable story of the Golden Rule began with Albert Bigelow, a retired World War II U.S. naval commander. Appalled by the atomic bombing of Hiroshima, he became a Quaker and, in 1955, working with the American Friends Service Committee, sought to deliver a petition against nuclear testing to the White House. In January 1958, Bigelow and three other crew members wrote to President Dwight Eisenhower, announcing their plans. As might be expected, the U.S. government was quite displeased, and top officials from the State Department, the Atomic Energy Commission, and the U.S. Navy conferred anxiously on how to cope with the pacifist menace. Eventually, the administration decided to ban entry into the test zone. Thus, after Bigelow and his crew sailed the Golden Rule from the West Coast to Honolulu, a U.S. federal court issued an injunction barring the continuation of its journey to Eniwetok. Despite the legal ramifications, the pacifists set sail. Arrested on the high seas, they were brought back to Honolulu, tried, convicted, and placed on probation. Then, intrepid as ever, they set out once more for the bomb test zone, were arrested, were tried, and, this time â€• sentenced to prison terms. Meanwhile, their dramatic voyage inspired an outpouring of popular protest. Antinuclear demonstrations broke out across the United States. The newly-formed National Committee for a Sane Nuclear Policy went on the offensive. 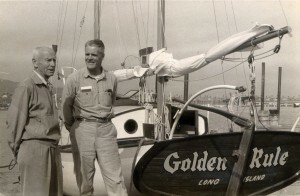 Moreover, an American anthropologist, Earle Reynolds, along with his wife Barbara and their two children, continued the mission of the Golden Rule on board their sailboat, the Phoenix. In July 1958, they entered the nuclear testing zone. That August, facing a storm of hostile public opinion, President Eisenhower announced that the United States was halting its nuclear tests while preparing to negotiate a test ban with the Soviet Union. Even as test ban negotiations proceeded fitfully, leading to the Partial Test Ban Treaty of 1963 and, ultimately, to the Comprehensive Test Ban Treaty of 1996, the Golden Rule dropped out of sight. Then, in early 2010, the vessel was discovered, wrecked and sunk in northern California’s Humboldt Bay. Contacted by historians about preserving the Golden Rule for posterity, officials at the Smithsonian Museum proved uninterested. But peace activists recognized the vessel’s significance. 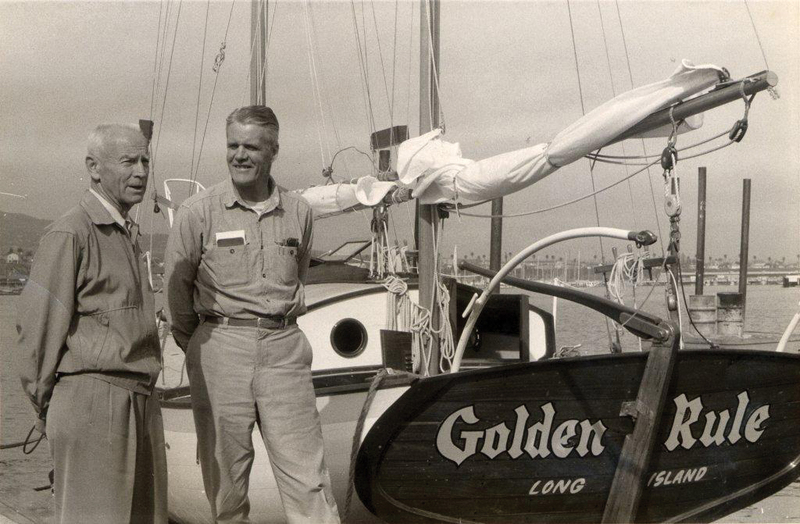 Within a short time, local chapters of Veterans for Peace established the Golden Rule Project to restore the battered ketch. As a result, the Golden Rule will sail again, restored to its role as America’s most important peace ship.